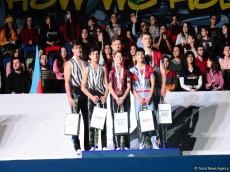 The winners of the FIG Acrobatic Gymnastics World Cup were awarded at the National Gymnastics Arena in Baku on Nov. 18. In women's pairs, gymnasts from Russia - Daria Chebulanka, Anastasia Parshina, Ksenia Zagoskina ranked first, gymnasts from Belarus - Yulia Ivonchik, Veronika Nabokina, Karina Sandovic ranked second, gymnasts from India - Ayusha Godeswar, Prachi Parkhi, Mrunmayi Valde ranked third. In men’s pairs, Timofey Ivanov and Maxim Karavaev (Russia) ranked first, Seymur Jafarov and Murad Akparov (Azerbaijan) ranked second, Daniyel Dil and Vadim Shulyar (Kazakhstan) ranked third. In women’s pairs, gymnasts from Russia Yasmin Ishankulova and Diana Korotaeva ranked first, gymnasts from Ukraine - Yulia Pilipyak and Alexandra-Maria Tabachinskaya ranked second. Gymnasts from India Avijit Debnat and Tinku Sarkar received the award ‘Media representatives’ sympathy’. Nikita Amoskin and Anastasia Dolganyuk (Kazakhstan) were awarded for artistry. Thus, for the first time in Baku, the FIG Acrobatic Gymnastics World Cup was held at the National Gymnastics Arena. Teams of Belarus, Israel, Kazakhstan, India, Russia and Ukraine participated in the competitions. At this World Cup, Azerbaijan was represented by the Bronze medallists of the last European Championships, Mixed Pairs - Abdulla Al-Mashaykhi - Ruhidil Gurbanli and Aghasif Rahimov - Nurjan Jabbarli. Silver medalists of the World Age Group Competitions (2016) - Seymur Jafarov and Murad Akparov competed for the best places within the Men's Pair. During the two-day events, gymnasts born in 2003 and older competed within Men’s Pairs, Women’s Pairs, Mixed Pairs, Women's Groups and Men's Groups.